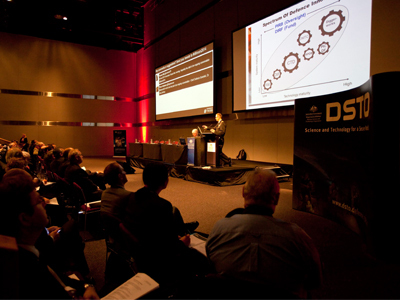 The Defence Innovation Forum was hosted by DSTO and the Defence Capability Development Group to encourage dialogue among industry, universities and research agencies on ways to improve the delivery of technology solutions to Defence. Converting smart ideas into Defence capability is an urgent challenge for Australia’s research and innovation sector, the inaugural Defence Innovation Forum heard today. Speaking at the D+I Conference, Chief Defence Scientist Dr Alex Zelinsky said Australia needs to do better when it came to innovation and the transition of technology to useful products. “We need an innovation system where all our institutions work together to conceive, develop and produce new technologies, taking them from novel concepts to products that support our defence force,” Dr Zelinsky said. The Defence Innovation Forum was hosted by the Defence Science and Technology Organisation (DSTO) and the Defence Capability Development Group to encourage dialogue among industry, universities and research agencies on ways to improve the delivery of technology solutions to Defence. Dr Zelinsky said Defence supported a number of successful innovation programs which needed to be integrated to produce a better outcome across the spectrum of technology development. “We need the ideas and the continuing involvement of all the players in the Australian industry and research sector to better our performance on innovation." As the Government’s lead science agency for Defence and national security, DSTO is taking a leadership role in developing the innovation system. “DSTO has a role in innovation integration, linking the end user - Defence - with Australian innovators,” Dr Zelinsky said. Vice Admiral Peter Jones, Chief of the Capability Development Group, also spoke at the forum, stressing that collaboration was vital for fostering innovation and maintaining the Australian Defence Force’s capability edge.